Do you love the smell of FailedAttachVolume and FailedMount errors with Kubernetes on AWS EBS? No? Oh. Well, here's what's probably causing them (and how to fix them). This blog is part of a new series on debugging Kubernetes in production. Portworx has worked with customers running all kinds of apps in production, and one of the most common errors we see from customers relates to failed attach and failed mount operations on an AWS EBS volume. This post will show you how to resolve Failed AttachVolume and FailedMount warnings in Kubernetes and how to avoid the issue in the future. When something happens that requires a pod to be rescheduled to a different node in the cluster, if the unmount and detach operations are not possible before the host becomes unavailable, you will not be able to attach it to a new host. In our experience, 90% of EBS issues and Kubernetes come down to this issue. You can’t start up a pod on some EC2 instance because its EBS volume is still attached to some other (potentially broken) host. Now that AWS has attached the EBS volume to our node, it will be viewable on that node at /dev/xvdf (or whatever device path we gave in the attach-volume command). We can then start writing files to /data. Because we have not used this volume before, we have formatted first the drive with an ext3 filesystem. In other words, Warning FailedAttachVolume is usually a symptom of an underlying failure to unmount and detach the volume from the failed node. The FailedMount error comes in that, because we were unable to attach an EBS volume to the new host, we are also by definition unable to mount that volume on the host. You can see one of the examples where this error is generated in the Kubernetes codebase. Let’s take a look at these failure scenarios and see how Kubenetes, using EBS, copes with them. We can simulate a network partition with an $ iptables -A DROP command on one of our nodes. When the network is killed, the kubelet is unable to communicate its status back to the Kubernetes master, is thus dropped from the cluster, and all its pods are rescheduled to other hosts. When the Docker daemon crashes or stops, the pods running on the host don’t stop. Kubernetes will nevertheless reschedule them to other hosts because the kubelet cannot report the status of those containers. If you place a nodeSelector in your pod spec, Kubenetes will respect that label when making scheduling decisions. When this affinity setting is updated, your pods are rescheduled to nodes that fit the nodeSelector criteria. This also applies to the cordon command – which makes use of node selectors to render a node unusable by pods. In both cases, by changing the values, Kubernetes will reschedule the pod to another node. In our tests, Kubernetes version v1.7.4 suffers from the problems mentioned above. Because it is not able to force detach the volume, it gets stuck and so cannot be attached to the new node. This will move the volume into an available state, which will enable Kubernetes to proceed with the attach operation for the newly scheduled node. Powers down and removes the EC2 instance. In the situations described above, neither Kubernetes nor AWS can determine that the EBS volume should be forcibly detached. It is always better to err on the side of caution after all when it comes to production disks — force detach sounds scary! Back to the instance failure test itself. Because the node is lost, k8s will reschedule our pods to other nodes, the same as above. 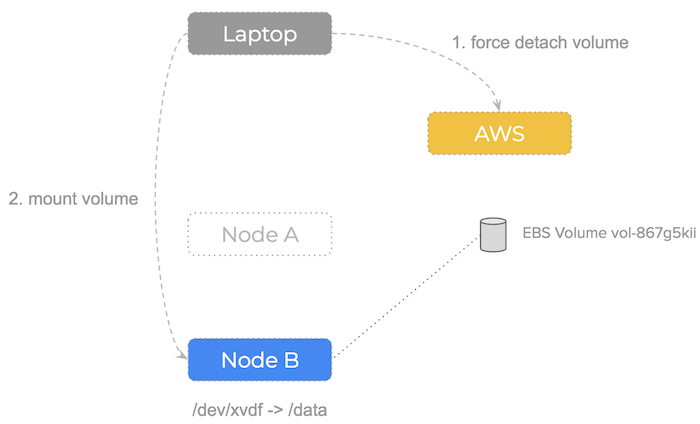 But because we are simulating the node failure using $ aws ec2 delete-instances, AWS issues what is essentially a force detach. This only works if you have a readiness probe for your pod so that the backend AWS API has a chance to update the state of the volume to available — this test failed when we removed the readiness probe. There are some failure scenarios above that could possibly be mitigated by updating the Kubernetes EBS driver codebase. However, the problem is one of fundamental architecture. When you use Portworx as your Kubernetes storage driver when running on AWS, this problem is solved because, once attached, an EBS volume stays attached and will never be moved to another node. If a node fails, the EBS volume fails with it and should be deleted. This really embraces the immutable infrastructure aspect of a cloud-native approach to a system. As you can see – Portworx consumes the underlying storage but decouples the actual drives from the volumes it presents to containers. Because the data is replicated and we are using shared volumes, the failover scenario we saw earlier becomes much simpler (and therefore less error-prone). ...is no longer needed — the target EBS drive is already attached and already has the data! That way, you will avoid the “Warning FailedAttachVolume” and “Warning FailedMount” errors that come with Kubernetes and EBS.